How do you prefer to get your caffeine? I can use caffeinated shampoo, shave cream, and after shave first thing in the morning before I ever make it to the kitchen! 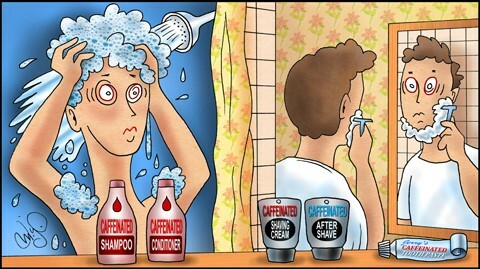 According to some articles, caffeinated shampoo stimulates hair growth and makes your hair stronger and healthier. Alpecin, one shampoo manufacturer, uses the term, “Doping for Hair.” I guess men who are balding might try any product that might help. I admit to trying the shave cream and after shave mostly so we could demonstrate the number of products that contain caffeine in our classroom fatigue training courses. We have also used caffeinated peanut butter as a snack during the classes. The Food and Drug Administration announced in 2016 that, in response to the trend in which caffeine is being added to a growing number of products, the agency would investigate the safety of caffeine in food products, particularly its effects on children and adolescents. What about caffeine’s effects on pipeliners? Shouldn’t the FDA be concerned about controllers in their slimming tights chewing Jolt Energy Gum or eating Perky Jerky all of night shift as a fatigue countermeasure? What is prompting manufacturers to create all of these caffeinated products? Are we so tired and under caffeinated that there is an ongoing demand for novel products? Caffeine keeps people alert and we need to be alert when on duty. It also stimulates the brain’s pleasure centers, and it is mildly addictive. But we need to use caffeine in safe amounts and at the right times of the day or during a shift in order to avoid negative consequences. Most healthy adults should be able to consume up to 400 milligrams of caffeine a day. That is the amount in four cups of brewed coffee. But every one of us has a different tolerance for caffeine and different types of caffeinated beverages. I stopped drinking coffee a few years ago because it increased my appetite and made me more anxious. I now get caffeine from tea, and that seems to be better for me. We recommend that people avoid energy drinks totally, and some of my colleagues believe sodas are evil. I used to drink large amounts of Diet Coke all of the time, and I recognize it hurt me more than it helped me. I drink lots of water now, and it is beneficial. Be an experiment of one. First consider how much caffeine you are currently using and from what sources. Investigate the amounts of caffeine and other stimulants in products. Look up the daily dose of caffeine you consume. Avoid beverages and other products that contain large doses of caffeine in large serving containers. Get adequate amounts of sleep so that you are not dependent on caffeine to get you going or keep you going during a shift. Cut back on caffeine if you are experiencing insomnia, anxiety, and digestive problems. If you try the caffeinated shampoo and it works, send me a picture of your newly grown hair.